I've said it before, and I'll say it again: my mother is what we in the Doney household refer to as the "total package." Stressed about anything and everything in life? No worries. She has it all under control, and she knows exactly what you need to do to fix your situation. Which is nice, because I have absolutely nothing under control or figured out. I'm working on it. Sometimes. I called mom yesterday and expressed my woes about how my lovely husband packed (aka, LOST) my camera cord. This means that I have about 5 different pictures of tasty recipes held captive on my camera, unable to make an appearance on my blog or on your dinner table. It has me in a funk. So she has shared this recipe with me and you, my wonderful readers. Warm olive oil in a small pan on medium low heat. Add minced garlic and cook for one minute. Don't let the garlic get brown. Remove from the heat and add white wine, lemon zest, lemon juice, dried oregano, thyme, salt and pepper. Pour sauce into a 9X13 baking dish. Wash and pat dry chicken (remove any giblets). Season well- inside and out with salt and pepper. 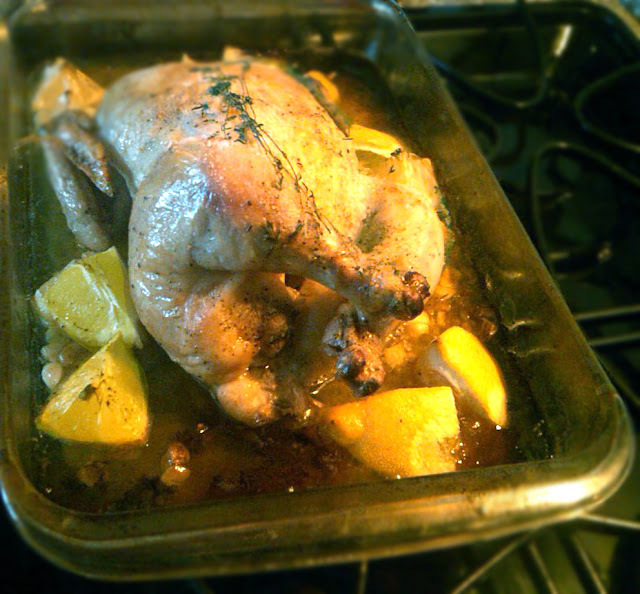 Put two or three wedges of lemon into the chicken cavity and place the chicken on top of the sauce in the 9X13 pan. Rub well with olive oil and lay a few sprigs of thyme on top. Place other lemon wedges around the chicken for seasoning. Once roasted, allow to "rest" under tin foil for 10-15 minutes. Enjoy with white rice, sauteed green beans and biscuits.